July 30 at 4th Ave.
Robert C. Thompson, 44, of Atlantic City was arrested by Ofc. Kevin Welsh for hindering apprehension on July 28. 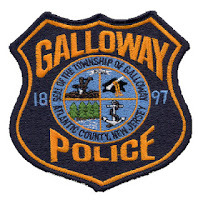 Eric M. Orgovan, 36, of Galloway was arrested by Ofc. Ronald Gorneau for DWI on July 28. Gregory M. Kovack, 24, of Absecon was arrested by Ofc. Scott Winneberger for DWI on July 28. Eric Scott, 48, of Camden was arrested by Ofc. Christian Magazzu for hindering his own apprehension on July 28. Jonathan D. Bryant, 22, of Atlantic City was arrested by Ofc. Scott Winneberger for possession of less than 50 grams of marijuana on July 28. Mark R. Denney, 46, of Mays Landing was arrested by Ofc. Kevin Costa for receiving stolen property and DWI on July28. Andrea Buscaglia, 26, of Mays Landing was arrested by Ofc. Christian Magazzu for hindering apprehension on July 29. Robert G. Hevalow, 44, of Sicklerville was arrested by Ofc. Jacqueline Crocker for DWI on July29. Kevin McKiernan, 46, of Galloway was arrested by Ofc. Rita Abatemarco for terroristic threats, disorderly conduct and resisting arrest on July 30. Dennis Gentile, 49, of Galloway was arrested by Ofc. Ronald Gorneau for obstruction, possession of a hypodermic needle and possession of drug paraphernalia on July 31. Jessie J. Patten, 33, of Galloway was arrested by Ofc. Ronald Gorneau for possession of CDS on July 31. Kathy R. Lea, 22, of Corbin City was arrested by Ofc. Scott Winneberger for possession of less than 50 grams of marijuana and drug paraphernalia on July 31. Quincy W. Slaughter, 31, of Galloway was arrested by Ofc. Scott Winneberger for physical threats and obstructing law on August 1. James R. Maker, 61, of Cape May Courthouse was arrested by Ofc. Kevin Costa for DWI on August 1. Keith S. Kirby, 29, of Pleasantville was arrested by Ofc. Christian Magazzu for criminal mischief and harassment on August 1. April Isidro, 25, of Atlantic City and Anthony Colon, 20, of Ventnor were arrested by Ofc. Scott Winneberger for hindering apprehension on August 2. Valerie A. Bailey, 48, of Galloway was arrested by Ofc. Kevin Welsh for DWI on August 2. Michael V. Thomas, 31, of Galloway was arrested by Ofc. Jacqueline Crocker for assault on August 3. A 17 year old boy was charged on July 30 by Ofc. Kevin Welsh with hindering apprehension and improper behavior.